While emperor Diocletian’s “Tetrarchy” system of shared power maintained calm for 20 years, eventually rivalries took over again. In 306 Maxentius proclaimed himself emperor, setting off another confused civil war. He gained great power when F.V Septimus marched an army against him which defected before battle. In 312, Constantine decided to resolve the dispute with Maxentius (his brother-in-law!) for control of the Western Roman Empire. With an army drawn from his western provinces of Britain, Gaul, and the Rhine, Constantine invaded Italy. He defeated Maxentius at Taurinorum, and expected Maxentius to hold out in Rome (as he had successfully done several times before) but instead he made a stand less than ten miles from Rome, in front of the Milvian Bridge crossing the Tiber River. Maxentius’ deployment was faulty, as his huge army was much too close to the Tiber River to allow room to maneuver. 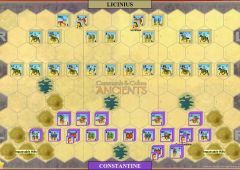 Although out-numbered, Constantine’s army attacked first and succeeded in pushing Maxentius’ forces back toward the river, with Constantine personally leading his Gallic cavalry forward. Seeing that the battle was going badly, Maxentius ordered his army to retreat and seek safety behind Rome’s strong walls, but the planned withdrawal degenerated into a rout as the retreating troops bunched up at the Milvian Bridge. Even Maxentius could not cross at the bridge and drowned. Constantine marched into Rome after the victory and was declared the sole Western Roman Augustus. Constantine later claimed a dream told him he would succeed “under this sign” (which various sources call the cross or the Chi-Rho sign) and this victory aided the rise of Christianity as Rome’s state religion. Imperial Legions rule is in effect for both armies. River hexes are impassable. Normal bridge rules are in effect for Milvian Bridge. 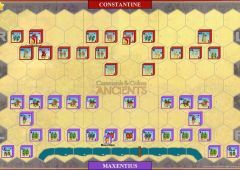 Maxentius' Army units that are forced to retreat into the river or off the battlefield will lose the entire unit instead of losing a block for each hex the unit cannot retreat.